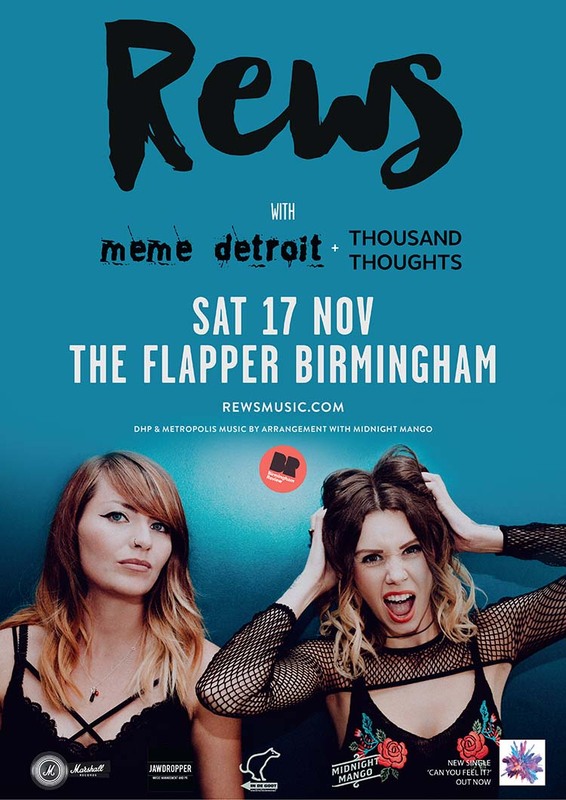 On Saturday 17th November, the mighty REWS return to Birmingham – rounding off a five date UK tour at The Flapper in Birmingham. Support at The Flapper comes from MeMe Detroit – Birmingham’s ‘sleazy rock’ grunge tinged indie punkster, who is out on the road promoting her new Life in the Now EP. Whilst joining REWS on all of their UK tour dates are Thousand Thoughts – Enfield’s fresh faced but ferocious nu metal/alt rockers who are currently promoting their debut single, ‘This One’s for You’. Doors open at 7:00pm, with tickets priced at £10 (plus booking fees) – as presented by Metropolis Music, arranged by Midnight Mango, and in association with Birmingham Review. For gig info and online ticket sales direct from REWS click here, or visit the Facebook event page here. It’s been quite a couple of years for REWS – the ‘rock powerhouse’ two piece who have been grafting and gaining fans up and down the country, belting out some of the best live shows on the circuit and backing up every on stage inch with their stellar debut album, Pyro. Wrapping their debut single, ‘Miss You in the Dark’, around a blue touch paper performance on Glastonbury’s John Peel stage last year, REWS quickly caught the attention of most music based national broadcasters – with Mark Radcliffe citing them as one of his highlights from the 2017 festival. REWS‘ second single, ‘Shine’, grabbed the airwaves through Kerrang!, Planet Rock, Radio X, Today FM, 2FM, and Radio 1. Whilst the band’s October’s follow up release, ‘Your Tears’, got featured as the BBC Music Introducing Track of the Week – getting public plaudits from presenters including Huw Stephens, Alice Levine, Clara Amfo, Scott Mills, Dev, Adele and Greg James. Coinciding with their autumn tour, which REWS will finish up and finale in Birmingham, one of the band’s strongest onstage tracks has got a studio spit and polish – ‘Can You Feel It?’ was released on 21st September, mixed and mastered by Romesh Dodangoda (Bring Me The Horizon, Don Broco, Lower Than Atlantis). But not stopping on these shores, REWS recently supported Halestorm on their UK tour – seeing them showcase in front of thousands of new fans across the country, in what we suspect is a precursor to a trip across the Atlantic. And North America is going to go bat sh*t for REWS, if you’ll excuse the crudity. But it’s a game changer and no mistake. REWS have also just come back from a showcase gig at the Music China event in Shanghai, as organised by their label Marshall Records, but we’re going to put out some Can-You-Feelers about this find out a little more… tbc. Joining REWS at The Flapper will be MeMe Detroit, who is touring the UK with her new Life in the Now EP – set for release on 23rd November. One of the brighter shining stars from the city’s music scene (and beyond, to be fair) MeMe Detroit is self described as ‘sitting somewhere between sleazy grunge and power indie… oozing sultry guitar driven hooks with a head turning vocal’ – a summation we liked so much, we stole it. Gritty and gutsy, covered in war paint, melody, and the occasional acerbic observation, MeMe Detroit released her debut album, Live to Love You’ll Love to Live, in 2016 – a ten track declaration that manages to kick you in the teeth, guts, and up the derrière all at the same time. Awesome. Follow up releases came in various shapes, sizes, and sharp undertones – with one of our favourites being the uber pertinent ‘Soc Med Junkies’, which pokes a well deserving stick in the rib cages of those silent conversationalists who are content to share only cyber space together. To check out the video to ‘Soc Med Junkies’, click here. And appearing with REWS across all of their UK tour dates this autumn are label mates Thousand Thoughts, who signed to Marshall Records in 2017. Currently promoting their debut single, ‘This One’s for You’, the Enfield based four piece ‘take on elements of nu-metal, pop-punk and alt-rock, interwoven with themes of tragedy and loss’ – with messages of hope and inspiration thrown in for good measure. Committing to a pretty rigorous touring schedule, the band have been playing up and down the UK since January 2017 – originally titled Elsewhere, but changing their moniker to Thousand Thoughts once the leaves of 2018 started to fall. To check out Thousand Thoughts’ debut single, ‘This One’s for You’ – released in June 2018, click here.